The whale's remains would be used for study purposes by the local marine academy. Jakarta: A sperm whale found dead in a national park in Indonesia had nearly six kilogrammes (13.2 lbs) of plastic waste, including 115 cups, in its stomach, park officials said on Tuesday. 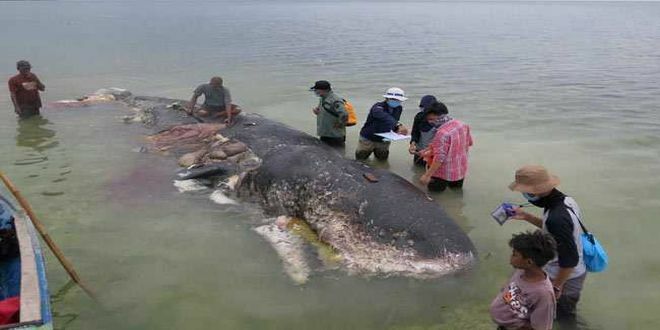 The 9.5-metre (31.17 ft) whale was found in waters near Kapota Island, part of the Wakatobi National Park, southeast of Sulawesi, the park said in a statement. The park is famous among divers for its large area of reefs and diverse marine life including rays and whales. The cause of death was not known, but park officials found plastic bottles, bags, sandals, and a sack with more than 1,000 pieces of string in the whale’s stomach. In June, the death of a pilot whale in Thailand with 80 pieces of plastic rubbish in its stomach garnered headlines locally but drew more attention outside the country. Indonesia ranked second behind China in the 2015 study of mismanaged plastic waste from populations living near coastal areas in 192 countries, has pledged $1 billion a year to reduce marine plastic debris by 70 percent by 2025.